In this article we take a look at two of the less common foods, couscous vs. quinoa. You’ve probably heard of one or both of them. But chances are you haven’t tried any. In this head to head matchup, we try to shed more light on these two foods. In this section, we go in depth to explain the difference between couscous and quinoa. The two foods aren’t among the more common foods we eat. But they’re very familiar to those who are in the know when it comes to nutrition and health. Both foods are well known for being alternative options to refined carbohydrates like white rice and pasta. Quinoa, which is pronounced at keen-wa, is considered one of the healthier carbs you can eat. It has been a piece of the human diet for several thousand years, hence it’s classification as an ancient grain. With the first evidence of human consumption dating back to the very beginnings of agriculture and more specifically, to the mountainous regions of South America. Quinoa has long served as a staple ingredient in the diet of humans. Among the less common grains around until recently, quinoa is cooked similarly to other grains where you’ll be adding some liquid to it, then allow it to cook. The video below shows you every step needed in making perfect quinoa at home. This is a great way to add this health food to your regular meals. Raw quinoa is high in protein, fiber, carbohydrates, essential amino acids. It also provides a significant source of vitamins and minerals. When it comes to essential amino acids, the ones are bodies must derive from food sources, quinoa stands as a major player. These tiny building blocks allow are body to heal, helping to promote healthy cell growth. Each serving of quinoa also contains a good amount of iron and magnesium as well. These nutrients work to prevent or control anemia while promoting heart and muscle health. 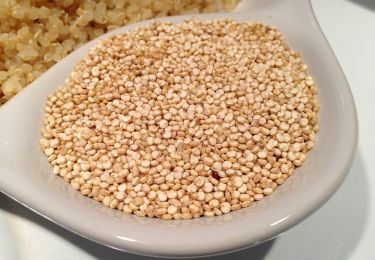 Quinoa is unique among the grain family in the fact that is gluten free. Health conscious individuals suffering from Celiac Disease and other forms of gluten sensitivity will find quinoa easy to digest, adding a healthy grain choice to a limited diet. Considered a superfood, quinoa is among the healthiest grains you can add to your diet. It is low in fat and high in protein and fiber. In order to preserve the high quality nutrient profile found in quinoa, it is best to serve the grain uncooked. When the outer shells are softened in room temperature water, quinoa seeds offer a healthy boost of protein to salads and sandwiches. Quinoa can also be served as an alternative to oatmeal and other grain cereals. It is important to remember that the more the seed is processed, the less nutritious it becomes. Heat tends to denature proteins, this forces our bodies to work harder during digestion. Often times, denatured proteins become unusable and in the case of quinoa, a major portion of the essential amino acids can be lost. 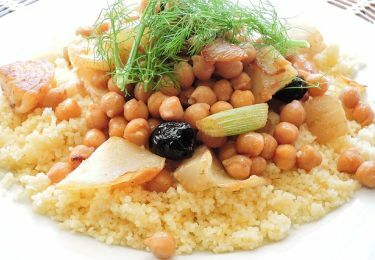 With historical references dating back over 2,000 years, couscous has been a mainstay in the North African diet for a very long time. Unlike quinoa, couscous is not a naturally occurring grain or cereal. Rather, it is primarily derived from durum wheat and is closely related to pasta. If you are looking to learn how to make couscous at home, here’s an easy to follow video that shows you how. It does take a bit of time to make couscous, but you don’t really need a lot of ingredients. This makes couscous great if you’re looking to make affordable meals. Couscous contains a moderate amount of protein and serves as a low-fat food high in calories. The presence of selenium helps promote a healthy heart and regulate cholesterol. In some studies, adequate amounts of dietary selenium have been shown to decrease the risk of certain cancers, such as cancers of the prostate. Selenium may be hard to find in everyday foods and because of this, couscous has become an important part of maintaining immune health. When going healthy, choose whole wheat couscous instead of the regular. 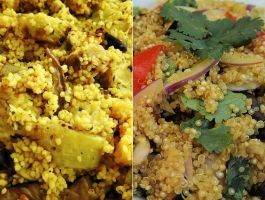 The difference between the two types of couscous is that whole wheat couscous contains a higher amount of fiber, around 5 to 6 grams per serving, compared to around 2 grams per serving in regular couscous. 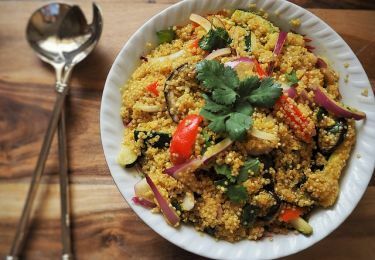 Couscous is rarely served as a standalone dish but can be a relatively healthy alternative to quinoa. It is often used to accompany other dishes because it has a mild flavor that blends well with others, including savory and sweet. This makes couscous a very versatile food. Throughout history, couscous has been used to compliment traditional stews and soups because it adds a good source of high-quality calories without adding a large serving of fat. To prepare couscous, raw semolina is rolled into tiny dough balls, steamed and then paired with a hearty serving of vegetables and meat. 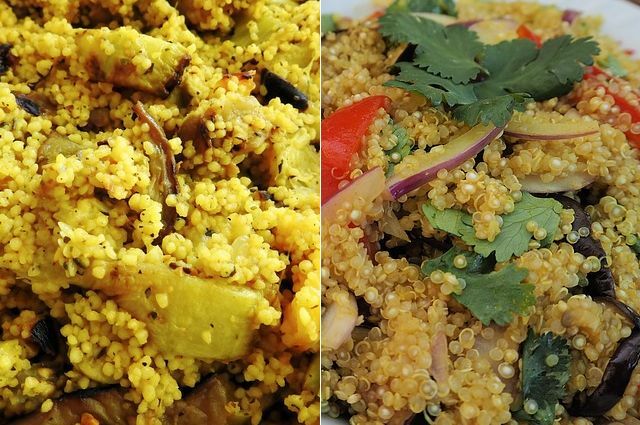 In our head to head matchup: couscous vs. quinoa, there’s a clear winner. In terms of health benefits, quinoa easily beats out couscous. It contains more nutrients and works better to control blood sugar thanks to its high fiber content. So as far as nutrition and health benefits are concerned, quinoa is the clear winner. However, when it comes to food in terms of taste and being able to blend with other foods, couscous wins. Couscous is easier on the palate and makes for a great accompaniment to other foods. This is one reason why couscous is often seen in restaurant menus and quinoa isn’t, save for health conscious establishments.